For the first Sprytile devlog, I'll be talking about what motivated me to create Sprytile and why I'm building it as an opensource tool. If you don't know what Sprytile is yet, it's a set of tools for Blender that helps build models using principles from 2D tile maps. Think of using the tiled graphics of the 16-bit and older era of games and using them to build in 3D. 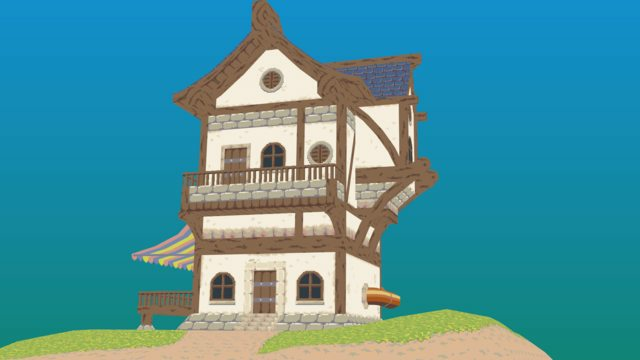 The main idea for Sprytile came from back when as an intern when I observed an artist build Animal Crossing style environments by painstakingly UV mapping each tile manually. Having an interest in that art style, I prototyped a script for 3DS Max that significantly improved that workflow. After graduation, I abandoned work on the script but the idea stuck with me until I came across Crocotile3D. It's a great standalone tool that did what I had envisioned all this time! By this time though, I've grown fond of using Blender and wanted those tools inside the Blender workflow, leading me to build Sprytile. I'm a big fan of open source software and libraries (name 3 albums). It's made my life easier as a programmer, the generosity of people making their software open source has been a big benefit to me and I wanted this project to give something back. There's a healthy ecosystem of commercial add-ons for Blender, but I felt that this isn't the right direction for Sprytile. The approach to 3D that Sprytile enables is a bit too niche to flourish in a purely commercial manner and besides which, I wanted the Sprytile to be accessible to the greatest number of users. Luckily, itch.io provides a platform that works well for open source projects. I was inspired by Tiled map editor, another open source project hosted on itch that operates on a name your own price model, which lets people give financial support to the project while remaining open source. In another devlog, I'll go a bit more in depth about what I'm learning from creating an opensource project and the benefits to the Sprytile of being in the opensource ecosystem. If there's an aspect of Sprytile development that you're curious about, leave a comment below and I'll try to write about it. If Sprytile is useful to you, consider giving a few bucks to support it! A rating on the itch page would also be appreciated! Will a stand alone ever exist? No plans for it at this time. If it ever becomes a stand alone program it would probably move to a paid model. I hope so! Since this was made I've been waiting for a stand alone. Id totally be willing to pay for something like this.